Teams are essential for accomplishing business goals in today’s work environment. Businesses are becoming increasingly reliant upon teams for solution finding and production. Additionally, virtual teams are increasing in acceptance and popularity, as five million employees are projected to work remotely by 2016. Based on these trends, research is warranted in exploring teams. 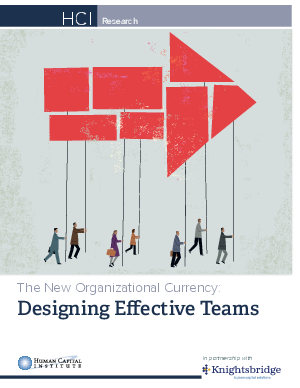 What are the characteristics of effective work teams? What challenges are teams faced with today? Are there uniquely important aspects which distinguish effective virtual teams from effective face-to-face teams? Download this whitepaper to learn how Knightsbridge Human Capital Solutions and Human Capital Institute (HCI), explored the current state of teams in today’s organizations.